I just led a two-day course on Improvisational Leadership. Not only was it a blast, I learned a lot from the students as well. Please join in on the posts talking about improvisational culture and what you think that looks like. it is fascinating to apply improvisational tools and then learn from the students…. I am frequently cast as the “mentor” in my organization, taking informal moments on one project or another to educate and inform; what I’ve learned is how much I learn from the inquisitive and “naieve” questions from folks whose opinions are not yet formed, who “don’t know any better” and who frequently ask, as a result, fundamental questions. Sometimes this leads to a wild and crazy pursuit of a new way of examining an issue or resolving one of our client’s challenges. You make good points, Eric (as usual). From what I know of you, you exhibit great improvisational leadership skills. One of the countless benefits of being an improv leader is that we learn so much from those we work with. Being mentally present, listening to really understand, and building on what others say creates powerful learning. And those who “don’t know any better” help us see past our “expertitus” (the condition of thinking we know more than we do due to our expertise). There is always more to learn. One way I counterbalance expertitus in myself is to consciously focus on “learning, not knowing”. Thanks again for another great contribution to the blog, Eric! I like the simple addition of “yes and”, it keeps the flow going. Reminds of this tip for meetings to derail negative thoughts: the next person to say something has to say what they like about the idea; and not what will not work. I like that idea, Toby. It’s a good antidote to some people’s habitual idea criticism of new ideas. One of the best things about “yes and” is that it is so much easier to remember than most tools I teach (or have seen others teach). People have approached me years after learning this from me and told me that they use it to be a better parent, spouse and, of course, worker. One young man put it as the screen photo on his phone so that he would be repeatedly reminded to approach most things in life with a positive and affirming attitude. Hi Bob – Thanks again for the class, It was great meeting you. I was really energized after our two days (and still am). I’ve taken a new look at Improvisational Leadership and how I do and can apply daily to situations – Especially the “yes and” principle. I’ve used this many times already at home with loved ones and at work in various situations. It’s great to hear from you. I’m always pleased to hear how people use the improvisational leadership concepts and skills. Particularly those that use it at work and home. I hope our paths cross many time in the future as well. There’s a lot of people using these and similar great approaches. Hey this is a great post and it’s really awesome you teach a course on how improvisation can improve businesses. 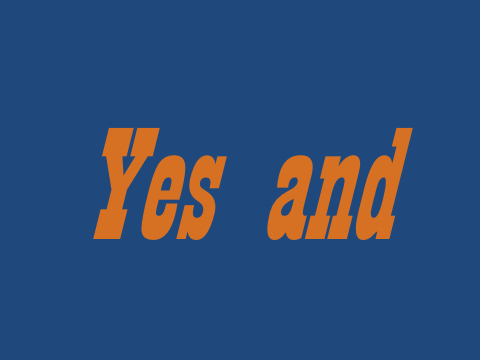 The yes and concept is fundamental is pretty much all of life. It’s fascinating, Vladimir. My Improvisational Leadership workshop is selling like gangbusters these days. I think the need to respond to change smoothly, quickly and positively are paramount — especially with the rampant changes today. I agree that “yes and” helps us in every part of life. I’ve found it makes me more confident, popular, friendly, sociable, relaxed and better at relating with everyone.